This work is intended for engineers operating in industries, which apply steel castings in their products. This does not only concern pure castings, but also: machine building (trans-portation, earthmoving equipment, mining, military machinery), power industry (gas and oil exploration, power generation), chemical industry (refineries, chemical plants), food and medical processing. Foundries produce part of the machines intended for these applications considering their working conditions: temperature (from minus 120 oC to plus 700 – 800 oC), stresses, strength or yield strength and resistance to the environment (corrosion, abrasion). To meet the requirements of casting users, their production process should ensure the appropriate quality of liquid metal, correctness of the technological process (among others: smelting, pouring, solidification and heat treatment) and technical control of each sub-process. Engineers who produce steel castings for the mentioned working conditions receive the basis in smelting of carbon and alloy steel, significance of the deoxidation process and modification of steel for castings (compared to wrought steel) and the properties of various types of cast steel operating e.g. in areas of sub-zero temperatures or corrosion. This knowledge is also useful for engineers in other specialties and working in the field of material engineering, metallurgy and manufacturing processes. This presentation is based on publications, own co-operations with foundries and institutes, and industrial practices provided in the last decades. 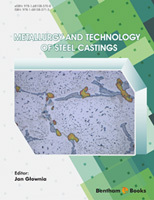 The intention of this book is to draw the reader's attention to the possible difficulties in obtaining an appropriate quality of castings as well as to indicate sources where more information on each subject of foundry engineering can be found. This book is also addressed to students who wish to obtain an overall knowledge of the steel castings technology.